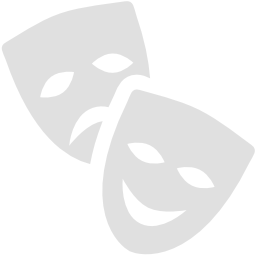 Blackfriars Theatre and Arts Centre is our passion and the aim is - to 'Keep Theatre Live' in the Heart of Boston. To be able to enjoy wonderfully talented amateurs and gifted professionals who will deliver something special for everyone in our hometown. As with any voluntary organisation people dedicate hundreds of hours of unpaid work to try and create or maintain a community based facility. Blackfriars continues to give strong support to the local amateur societies and delivers a very high standard academy for the youth in our area. Also in the past few years the Centre has seen a return to its core values and re-opened as an Art Gallery. The board of Directors/Trustees entered into the first phase of the Blackfriars refurbishment plan in 2015, which was replacing the seats in the auditorium with special emphasis on extra legroom. We launched two initiatives to help finance the project. 1-As a theatre we have never charged a ‘booking fee’ at our Box Office and don’t intend to. It is however our intention to introduce a 50p per ticket refurbishment ‘levy’ from September 2015. This money will go directly into a fund to maintain and improve our facilities. This fund also creates ‘match Funding’ opportunities for us to explore and apply for. 2-We are also delighted to ‘re-launch’ our ‘Sponsor a Seat’ campaign’ to individuals. 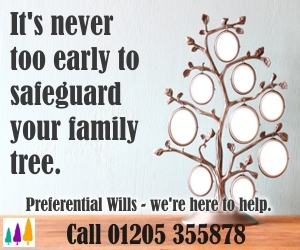 The offer includes an engraved message/dedication on the seat of your choice (subject to availability). Please ask Box Office or see below for more information. The success of any town is dependent on the facilities offered within it. We are grateful to all the volunteers and donations we have received so far. We hope that more will support us in the future. We are delighted to announce the ‘re-launch’ of the seat sponsorship which coincided with Phase 1 of the seat replacement in the Auditorium. We are sacrificing a chair in each of Rows A to E to facilitate a wider chair but perhaps even more importantly we have increased the footplate between the rows. Rows F and G are to be included in Phase 1 as is new carpet to compliment the new seats. The Directors wish to thank those ‘Seat Sponsors’ who have been patient over the years when it has not quite been possible to begin the process. Each seat, extended footplate and new carpet will cost approximately £240. The Auditorium was closed throughout August and re-opened in September with Phase 1 complete. We are hoping to raise enough funds to enable Phase 2 to begin in August 2016 as we celebrate our 50th Anniversary of those volunteers who cleared the site and raised funds to build the ‘Little Theatre’ we still enjoy today. 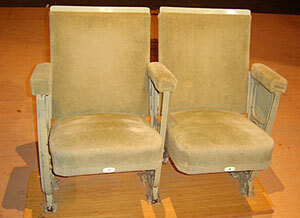 Some of the old seats to be replaced. 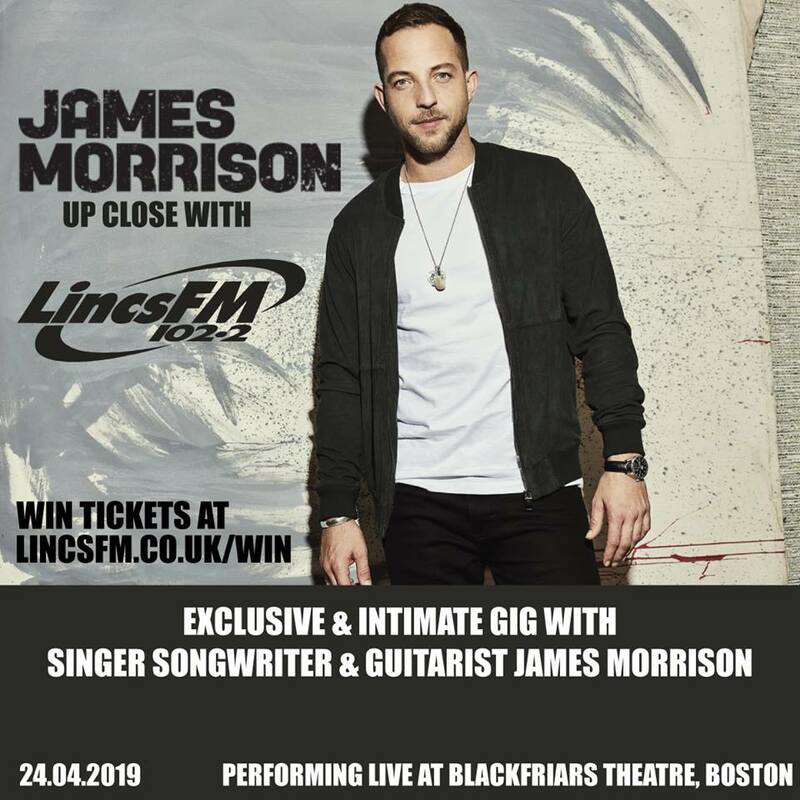 To receive a 'Sponsor a Seat' application form please call Box Office on 01205 363108 or email marketing@blackfriarsartscentre.co.uk. 2015 saw the installation of new seats with more leg room to half the auditorium, this provided a huge boost in comfort for our audience. Having received appreciative comments, thoughts turned to the next project. 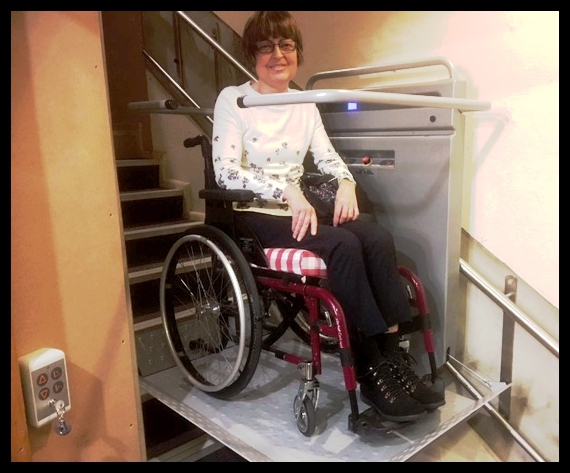 Research began to find a better way to access the Auditorium for both wheelchair users and those with walking difficulties. 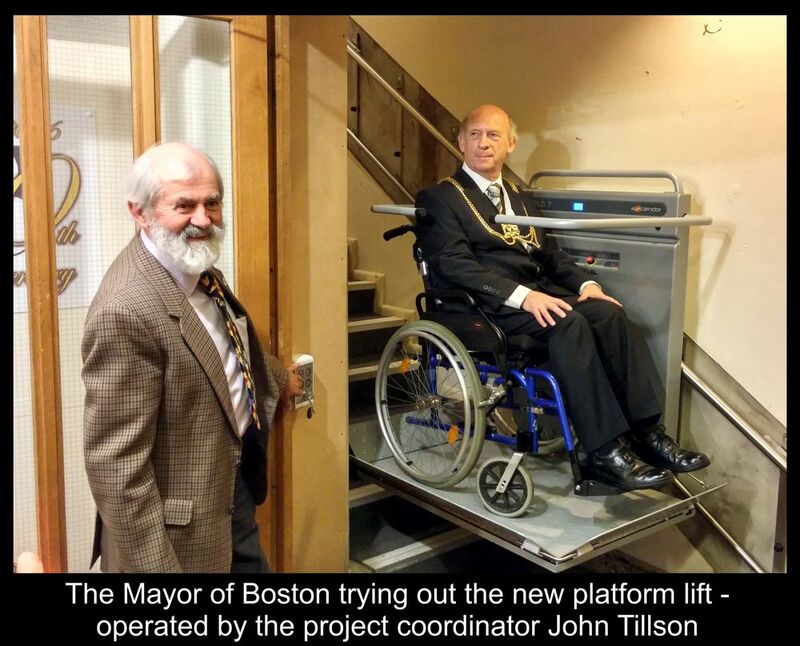 After months of planning and preparation a Platform Lift was installed in time for our 50th Anniversary Gala Evening in October 2016. Thanks to everyone who has supported Blackfriars Theatre over the past year we were able to move onto the final part of Phase 2 in 2017. The money from the Refurbishment Levy continues to come in and we hope you can see how this money is being spent. From the painting of the external windows and doors to the renewal of lights and upgrading of the alarm, these little things are all important to ‘Keep Theatre Live in Boston’. 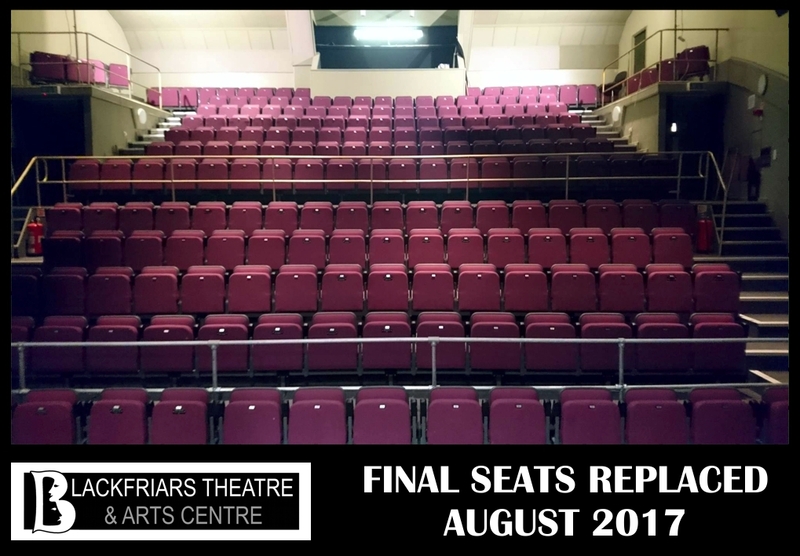 We are delighted to have been able to complete the auditorium seat refurbishment during August 2017 and are excited to see the auditorium looking so good. The Seat Sponsorships and Donations have played a massive part in this achievement and it is crucial this continues. You will also notice the Sound and Lighting Box at the rear of the auditorium has also had a ‘make over’, all part of renewing and upgrading the required technology. As a Theatre and Arts Centre, we believe we are providing a Community space for all to enjoy and benefit from. Accessibility for everyone is essential to this aim. We are delighted to announce a generous legacy has been donated to start a special fund to provide a lift from the Foyer to the first floor giving greater access to the Auditorium, Bar area and the ‘Upper rooms’. More on this as it progresses. 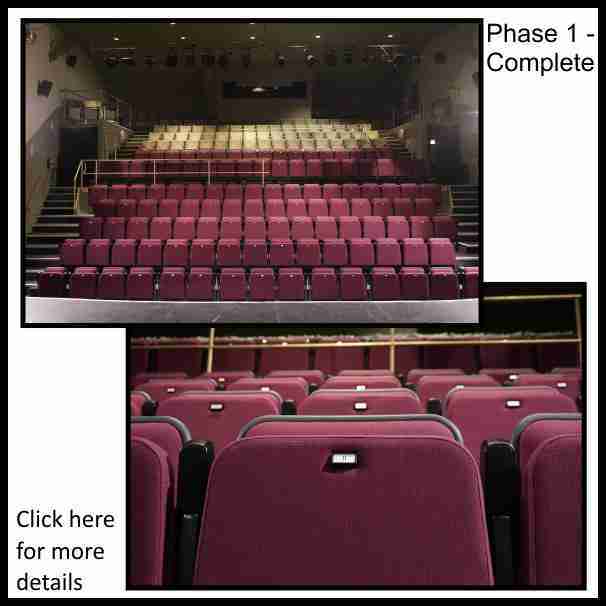 The Directors of Blackfriars Theatre and Arts Centre are delighted to announce another exciting upgrade to the facilities here at Blackfriars Theatre. Over the past 3 years we have been actively seeking support from outside sources to help us ‘Keep Theatre Live’ in Boston by completing much needed renovations and upgrades to the facilities here at Blackfriars Theatre and Arts Centre. Many thanks go out to Ørsted for a grant of £18,820.00 through their East Coast Community Fund which has enabled us to complete our latest project and replace the old kitchen in the building with a beautiful new state-of-the-art commercial grade kitchen, with all new stainless-steel fixtures and fittings. 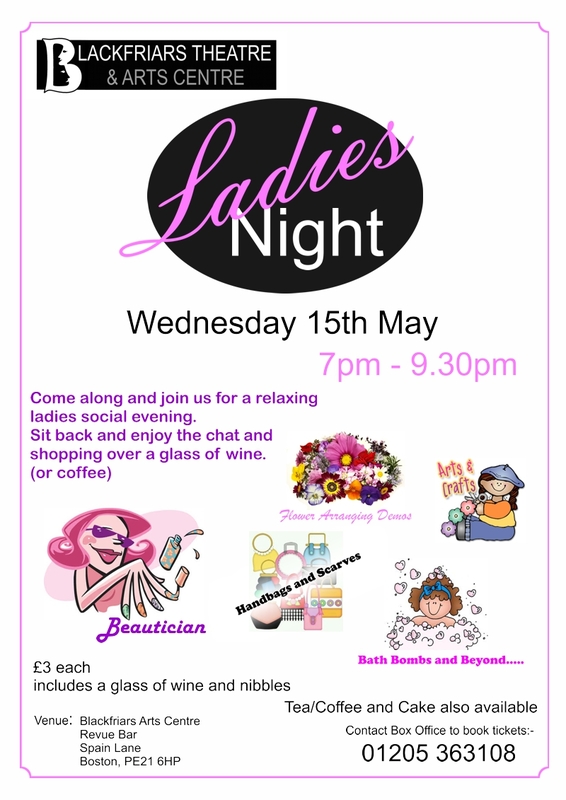 Click here for more details and images. August 2018 - New Lift is installed. We are excited to confirm that we will be having a lift installed at Blackfriars Arts Centre during August 2018. This will mean that the building is closed for the majority of August while the structural work in the foyer takes place. We will also take this time to do some of our annual maintenance on the building. More information about this and other project to follow.